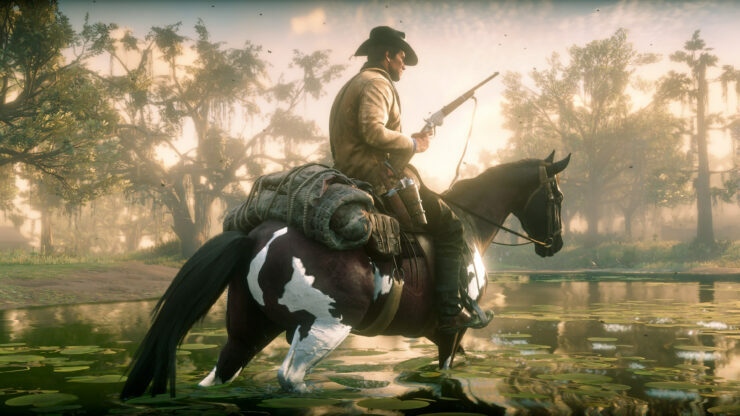 Red Dead Redemption 2 is one of the most anticipated games launching in these final months of the year, and it seems like Xbox One X users will be able to enjoy the game in the best possible way. A few hours ago, the Xbox France Official Twitter profile confirmed that the Rockstar Games open-world title is going to run at native 4K resolution and HDR support on Xbox One X. Le nouveau trailer de gameplay de #RedDeadRedemption2 est disponible ? Red Dead Redemption 2 is also going to run at 4K resolution on PlayStation 4 Pro, but likely not native. HDR support has also been confirmed for both PlayStation 4 Pro and regular PlayStation 4 model. On PS4 Pro, 4K HDR TV owners will benefit from enhanced graphics and optimized performance for a stunningly sharp and detailed look (when compared to a PS4 system), as you live, ride and fight to survive as an outlaw in a notorious gang. HD TV owners will benefit from increased image clarity through the PS4 Pro’s Supersampling Mode (you can turn on Supersampling Mode in the PS4 Pro system settings menu). Meanwhile, if your TV supports high-dynamic range (HDR), you’ll experience the picturesque scenery of Red Dead Redemption 2 with an even more vibrant and dynamic range of colors (HDR features also available on PS4 system). Red Dead Redemption 2 launches on PlayStation 4 and Xbox One later this month, on October 26th.